Bangaluru: In a significant move to harness solar energy, a 3.5MW solar power project was inaugurated by Mr. T. Suvarna Raju, CMD, HAL at HAL airport here to coincide the HAL's Foundation Day. 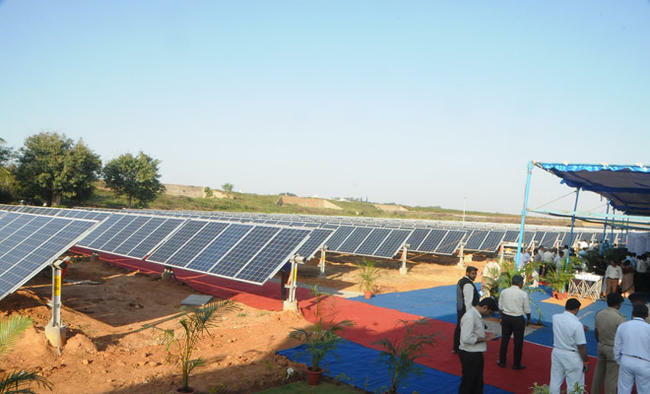 The project is spread over 23 acres with 12,985 solar modules installed. “We are pleased to be a part of this environment friendly initiative by focusing on renewable energy to meet our demand for electricity. It is perfect example of promoting climate protection and conserving precious energy resources. The project enables us to use solar power and cut down our dependency on normal electricity”, he said. The power requiremnt of LCA-Tejas Division would be met to begin with he added. Mr. T. Suvarna Raju, CMD-HAL inaugurating a 3.5MW solar power project at HAL Airport Bengaluru. The project is commissioned by the Amplus Energy Solutions. Speaking on the occasion, Mr. Sanjeev Aggarwal, Managing Director & CEO, AES, commended HAL’s decision to install a significant renewable energy capacity for its power consumption in Bengaluru. The project is unique as this is the first single-axis tracker based solar installation at an airport in India. In addition to cost savings, a 3,900 kWp solar facility would reduce emissions by 1,66,257 MT of CO2 over the life of the plant, which has the same effect on CO2 emissions as reducing consumption of 3,84,921 barrels of crude oil or planting 1,90,903 trees, he said. The project complies with domestic content requirement (DCR) since the modules used in this project are manufactured in India. The Amplus had won this project in a competitive bidding under developer mode where for the first time the VGF (Viability Gap funding) was negative. As part of its commitment given to the Government, HAL is in the process of establishing 50 MW capacity renewable energy in next two years. The Company plans to install 35.8 MW capacity solar plants. Out of this, 9.275 MW will be from roof-top solar systems. Approximately 15 MW capacity will be from wind power plants. In July this year, HAL had taken a lead in commissioning 6.3 MW wind power plant at Harapanahalli in Davangere district of Karnataka to meet the Company’s captive power needs in Bengaluru. HAL is also evaluating the proposal for setting up 150MW capacity solar power plants in partnership with BEL and MDL. The plants will be set up in the land owned by Ordnance Factories across India. The power produced will be sold to respective Ordnance Factories.